Inspired by a true story, this heart-wrenching and gritty drama follows career army veteran Hank Deerfield (Tommy Lee Jones) who gets a startling phone call from his son Mike’s base in New Mexico’s Fort Rudd stating that Mike (Jonathan Tucker) has gone AWOL just after returning to American soil from his time in Iraq. 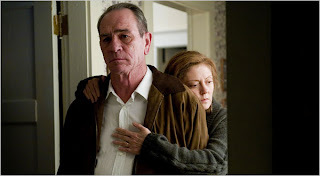 Leaving his worried wife Joan (Susan Sarandon) behind, Hank sets off from Tennessee to try and find his son, assuming that he’s just disappeared for awhile to enjoy himself and blow off some much needed steam only to be devastated by the unspeakable aftermath following the discovery of his son’s charred remains. Caught between the bureaucracy of the army base that wants to take over the investigation of one of its own and the local police who struggle against that red tape daily, Hank fears that the crime will be covered up and conducts his own investigation after grudgingly receiving help from Detective Emily Sanders (Charlize Theron) who, tired of being ridiculed by her sexist male coworkers aids Hank in his quest. With only a few clues to go on sent by Mike himself in the form of e-mailed photos and a fried cell phone containing brief video clips shot by Mike while in Iraq that Hank hires a hacker to try and unscramble, Hank and Emily go down a road of haunting deeds and outrageous lies that shocks them, and the audience, to their very core. While largely ignored, as other Iraqi themed films were in the fall of 2007, In the Valley of Elah garnered rave critical reviews including prominent placement on top ten lists from noteworthy sources and also recognition in the form of an Oscar nomination for Jones as Best Actor, although his role in this was overshadowed by his even more potent supporting turn in No Country for Old Men which, like Elah, also costars Josh Brolin. Written specifically for Theron and originally as a vehicle for Clint Eastwood who helped get the film greenlighted (IMDb), talented writer/director Paul Haggis (Crash) crafts a memorable and emotionally charged film that will not only haunt audiences for days but also admirably and subtly without preaching, make us wonder just what we are doing to another generation of young military men and women by sending them into foreign countries to fight wars that do not make any sense, yet they go bravely like David fighting Goliath in the biblical story where the film received its name.